What are 'Computer Name' and 'Personal Key'? What are the checks to be made before connecting to a remote computer? Which version of Mac OS X is supported for the RemotePC application? 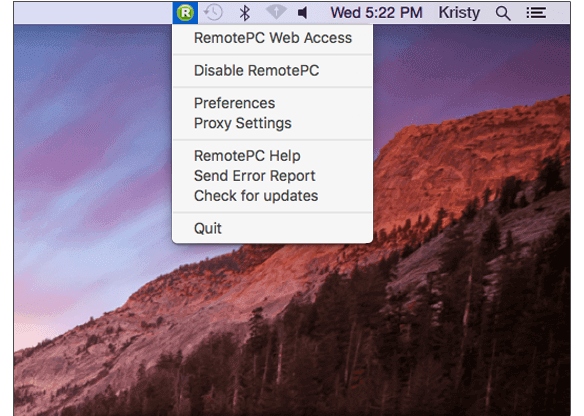 Do I need to pre-authorize RemotePC in Mac OS Mojave for remote access? What are the options available in the RemotePC tray? What are the different states of RemotePC? How do I get started and configure my computer for remote access? Can I access any computer briefly for remote access? How do I view and access my remote computers? Can I remotely access a Mac from a Windows computer? What is the 'Connect to active session' feature? What do the options under 'Always-ON Remote Access' tab signify? I forgot the Personal Key of my computer. How can I reset it? Can I scale the remote computer's desktop screen to fit within my local computer window? Does RemotePC support multi screens (monitors)? Can I transfer files between Windows and Mac? How do I transfer files/folders without starting a remote session? Can I chat during a remote session? Can I record the remote session activities? Can I make notes on my remote computer screen? If yes, how? How do I use Whiteboard during a remote session? Can I play music and watch video on the remote computer? Can I use keyboard shortcuts (such as Ctrl + C) on my remote computer during a remote session? Can I lock the partner computer screen? What is 'Blank Host Screen'? Can I block keyboard and mouse input for remote computer? Can I print documents on my remote computer? Can I use the RemotePC application via VPN (Virtual Private Network)? Can I end an ongoing session when my computer is getting accessed? How can I rename or remove configured computers from my account? Can I drag and drop or copy files/folders between my local and remote computer? How can I configure Proxy Settings to use the RemotePC application? What is Wake-on-LAN (WOL) in RemotePC? How do I enable WOL in RemotePC? How do I wake up an offline remote computer via WOL? 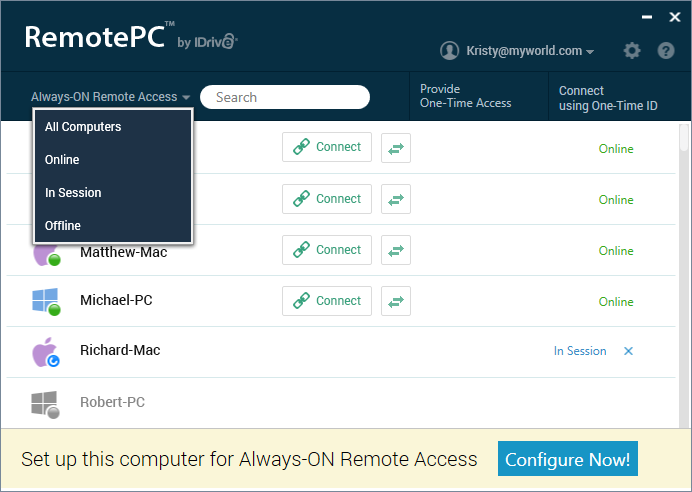 RemotePC allows you to access and manage your distant computers anytime, from any device - given that the computer has an active Internet connection and the RemotePC application installed on it. You can login to your office or home computer from anywhere, manage your files and work on your computer - as though you were sitting right in front of it. You can also invite an associate to access your computer to work on a presentation or help troubleshoot. Computer Name: Computer Name is the default name of your computer, used to identify it for remote access. You can edit the computer name at any time. Personal Key: Personal Key is a password set by you and acts as your computer's unique access code. It is stored only on your computer and not on the RemotePC servers. What are the checks to be made before connecting to a remote computer ? Both the local computer and the remote computer must be connected to the Internet for remote access. RemotePC application should be running on both local and remote computer. If required, setup the firewall to allow RemotePC. The RemotePC application for Mac requires Mountain Lion version 10.9 and above on Intel processor. 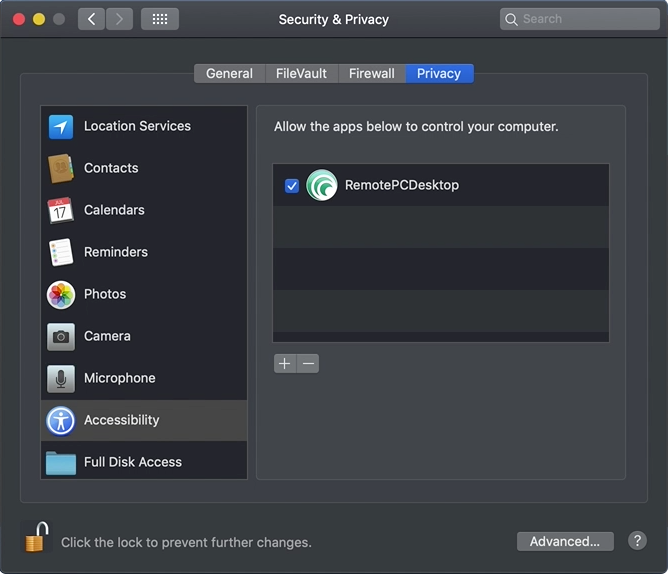 Yes, Mac OS Mojave requires user consent for applications to access privacy sensitive data. Hence you need to grant accessibility permissions to RemotePC, in order to remotely access your computers. Choose 'Open System Preferences' from the popup which appears when you try to remotely access a Mac or from the Apple menu. You will be redirected to 'Security and Privacy' preferences. Select 'Accessibility' under 'Privacy' pane. Click and provide system authentication to allow changes. Select the checkboxes next to RemotePC related apps, e.g. RemotePCDesktop, RemotePCView. On installation, RemotePC creates a tray icon on your computer. Right-click the icon and a menu appears. There are three different states of RemotePC, which you can identify by the color your RemotePC tray icon turns into. 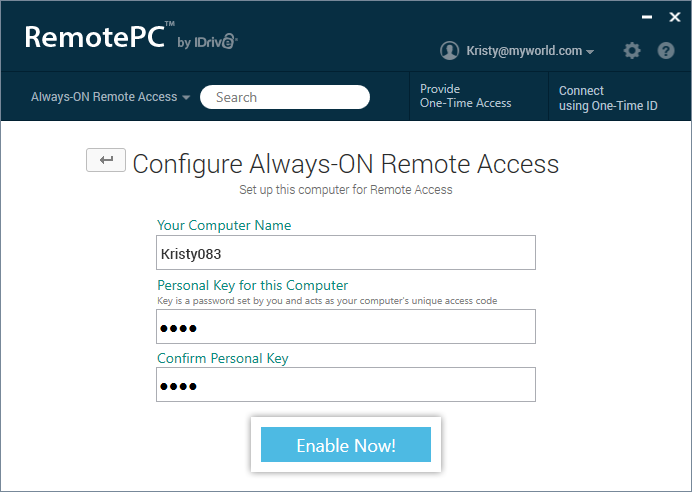 To get started, sign up for a RemotePC account. Download the RemotePC application and install it on your computer. Once you setup and run the application, you will be redirected to the login page. Login to your RemotePC desktop app, and configure your computer for remote access. After login, on the RemotePC home screen, click 'Configure Now!'. Set 'Computer Name' and 'Personal Key' for your computer. Note: As Personal Key is optional for Enterprise users, they will not be asked to assign a key while configuring a computer for the first time. However, if you want to set Personal Key refer FAQ. Your computer is now configured and will appear on the app home screen. You can access it from any distant computer. 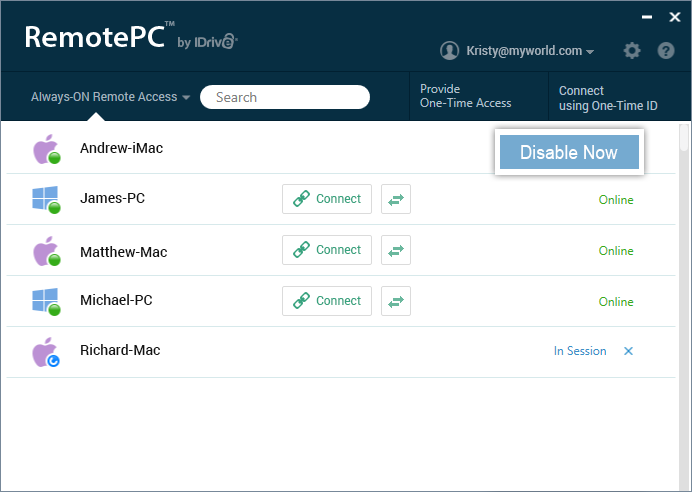 One-Time Access enables you to let any of your associates temporarily access your computer from wherever they are. 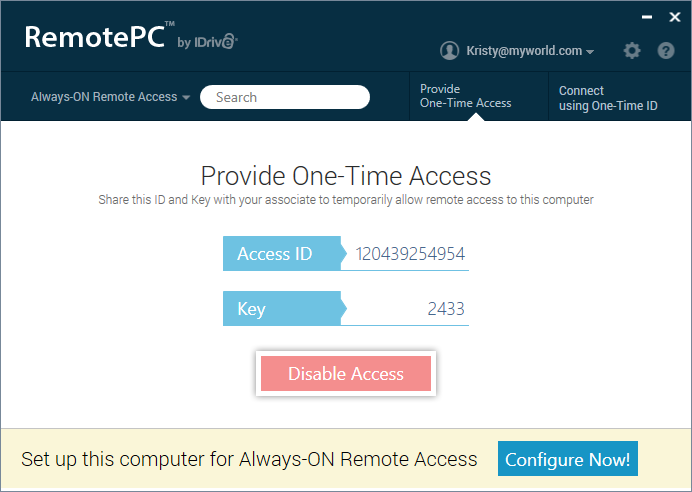 All you need to do is set up One-Time Access credentials on your computer and share it for establishing an instant remote access session. You need not share your RemotePC credentials for establishing a One-Time Access connection. Launch the RemotePC application and log in. Go to 'Provide One-Time Access', and click 'Enable Now!'. The 'Access ID' and 'Key' values get generated. Copy the values and share it with your anyone who wants to remotely access your computer. To disable an ongoing instant access session, click 'Disable Access'. 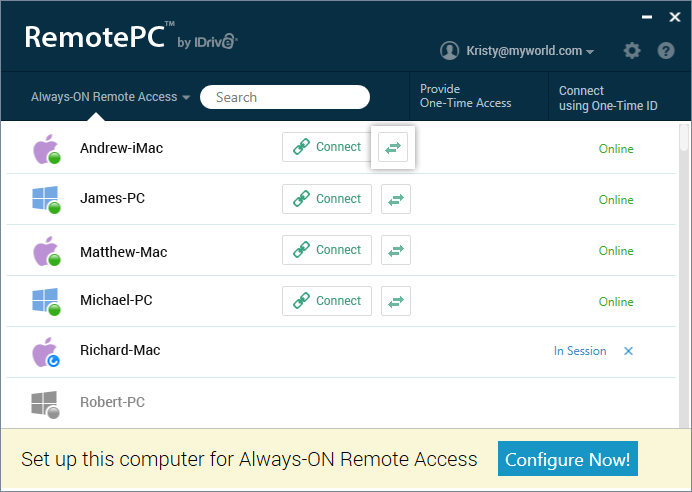 You can easily connect to your associates computer briefly for instant remote access or just to transfer files. Enter 'Partner's Access ID' and 'Key' under the 'Connect using One-Time ID' section. Select 'Remote Access' to remotely access the computer, or select ‘Transfer Files’ to transfer files to/from the computer. You need to configure your computers for remote access to connect to them from anywhere. Your configured computers appear under 'Always-ON Remote Access'. Note: You can filter the list of computers based on their status, by clicking . Click 'Connect' against the online computer you want to connect to. If you wish to just transfer files, click . Enter Personal Key and click 'OK'. A remote access to the computer is established. 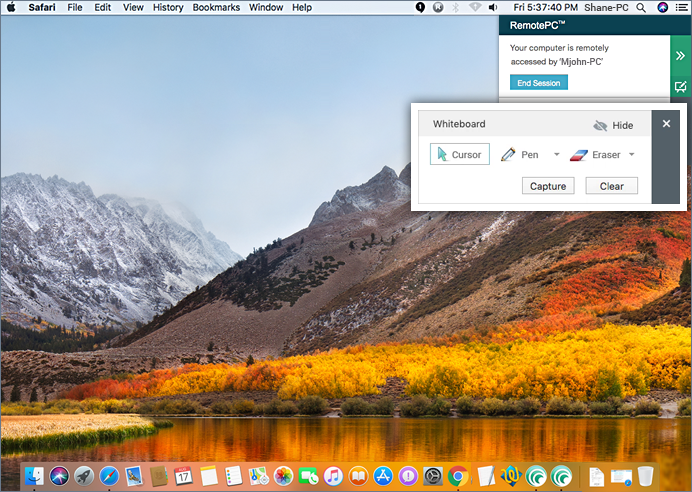 Yes, you can access your Mac from a Windows computer and vice-versa. You can also access a remote computer from your iPhone/iPad or Android device. 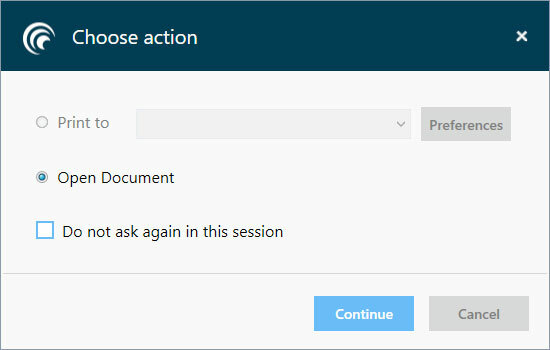 The 'Connect to active session' feature is primarily for server machine access to connect to ongoing active sessions. 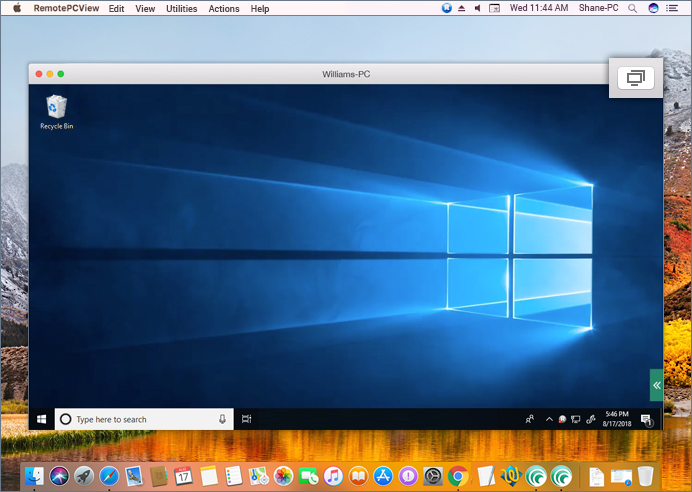 It allows users who are connected to any server via Remote Desktop Protocol (RDP) to instantly join an active session. Launch the RemotePC application and login. Select the 'Connect to active session' checkbox. If you uncheck the 'Connect to active session' option, users will have to login to the application and click 'Connect' against a particular Windows machines to initiate a remote session. Note: This feature is only available for Windows. 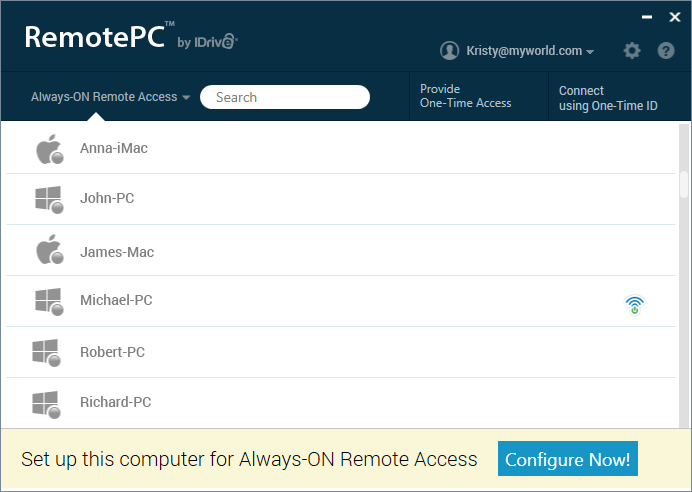 'Always-ON Remote Access' tab displays the list of computers configured for remote access, and their current status. You can filter computers in the list based on their status. All Computers - Displays the list of all the computers configured to your account. Online - Displays the list of computers that are ready for remote session. In Session - Displays the list of computers which are in an active remote session. Offline - Displays the list of computers that do not have either any active Internet connection or the remote access configuration has been disabled on it. In case you forget the Personal Key of your computer you need to first disable Always-ON Remote Access for the computer and then reconfigure it. Launch the RemotePC desktop application on the computer you wish to reset the key. 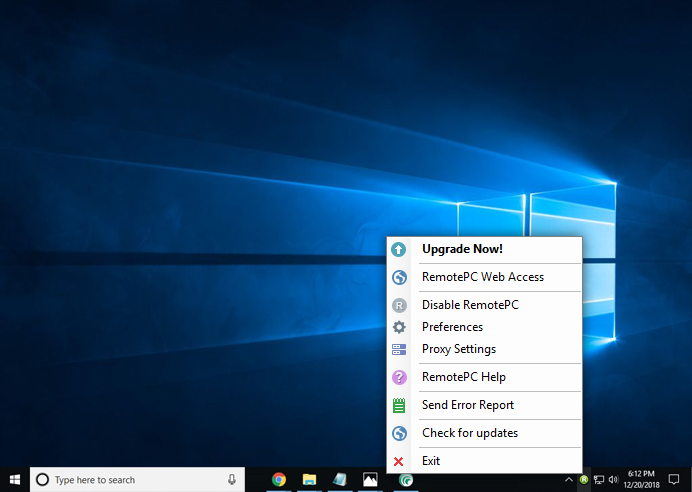 Click 'Disable Now' displayed against your computer name in the 'Always-ON Remote Access' section. Click 'Yes' in the confirmation window. Once 'Always-ON Remote Access' is disabled, click 'Configure Now!' on the home screen. Enter the new Personal Key and confirm the same. Yes, you can scale the remote computer's desktop screen to fit within your local computer window, as by default the RemotePC desktop screen does not auto fit to your local computer window. Connect to an online remote computer and establish connection. From the application menu, go to 'View'. Click 'Best Fit'. This will resize the remote computer desktop screen to fit within the local computer window. You can also scale the remote computer's desktop screen to fit your local computer screen. From the application menu, go to 'View' and click 'Full Screen'. Connect to an online remote computer, and establish connection. From the application menu, go to 'View' -> 'Scaling'. To revert, click 'Scaling' -> 'Original Size'. 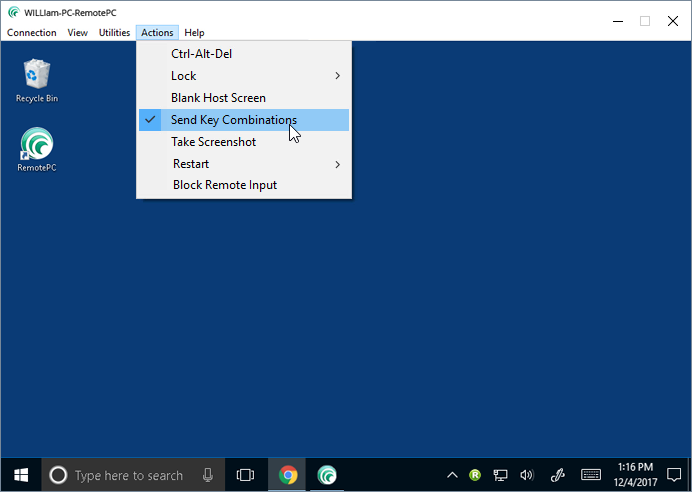 To view the remote computer desktop screen in Full Screen, from the application menu, go to 'View' and select 'Enter Full Screen'. Yes. If your remote computer has more than one monitor, the RemotePC app allows you to switch between multiple screens. 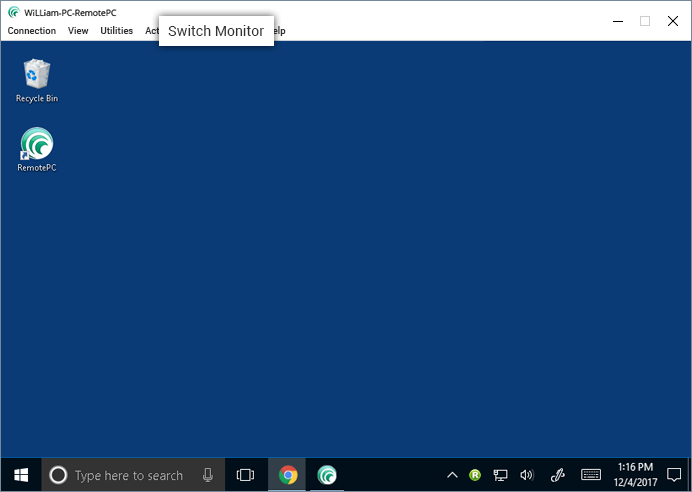 On the application menu, click 'Switch Monitor' to switch between multiple monitors of the remote computer. Alternatively, from the application menu, go to 'View' and click on the required monitor to view that individual monitor. Click 'Extended' to view all the monitors. Click on the top-right corner of the screen to switch between multiple monitors. Alternatively, go to 'View' -> 'Monitors' and click on the required monitor to view that individual monitor. Click 'Show All Monitors' to view all the monitors. Note: You can also change the screen resolutions for individual monitors from here. Yes, you can transfer files/folders between Windows and Mac. Make sure the latest versions of RemotePC application is installed on both the computers. From the 'Connect using One-Time ID' tab, select the 'Transfer Files' button before starting the connection. During a live remote session, go to the application menu; click 'Utilities' - > 'File Transfer'. On the 'Always-ON Remote Access' tab, click on a computer name, enter the key and click . 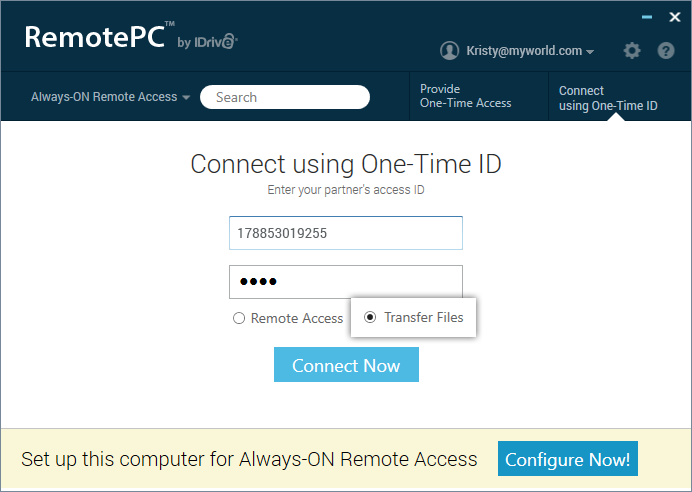 Go to the 'Connect using One-Time ID' tab and enter the 'Partner's Access ID' and 'Key'. Select the 'Transfer Files' button and click on 'Connect Now'. The File Transfer screen appears. Note: Upon successful establishment of connection, a log summary appears on the remote computer. To send files/folders from your local to remote computer, from the Local Computer drop-down menu, select files/folders you want to send, and click . 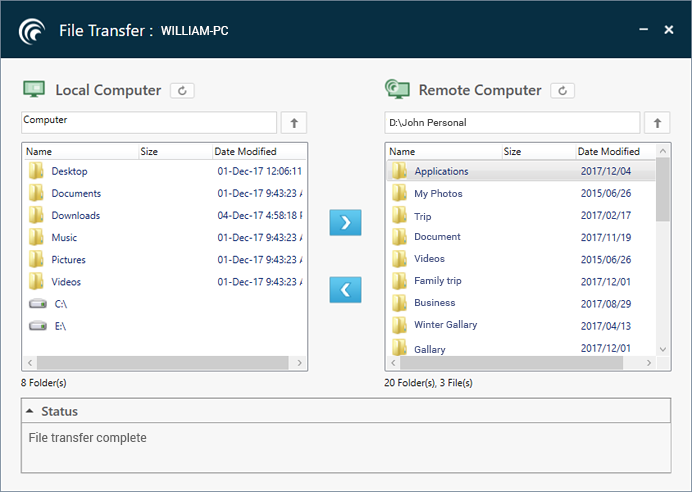 To receive files/folders from the remote to your local computer, from the Remote Computer drop-down menu, select files/folders, and click . The progress of the transfer is shown in the 'Status' section. 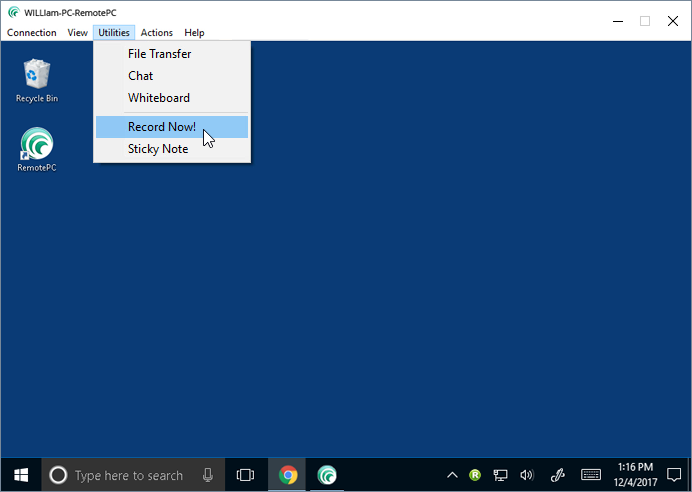 You can also create new directories, delete, and rename files/folders on your remote computer. File/Folder transfers between your remote and local computers can be aborted anytime from the remote computer. Yes, you can chat with your partner at the remote end during a remote session. From the application menu, go to 'Utilities'. Click 'Chat'. The Chat screen appears. Enter your message in the 'Type your chat below:'/'Enter your text below' field and click 'Send'. 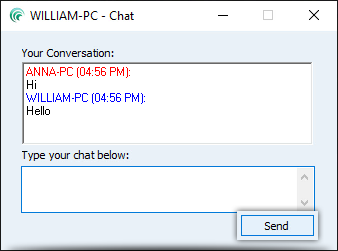 Note: The conversation between the local and remote computer is displayed in 'Your Conversation'/'Your chat conversation' field. 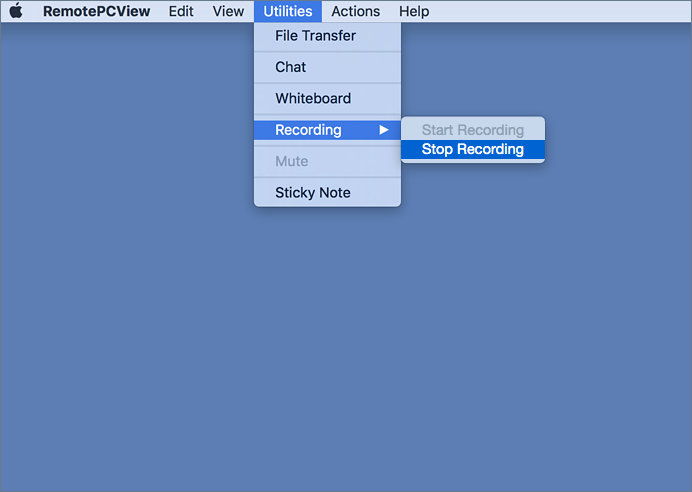 Yes, you can record remote sessions and save it at a desired location on your local computer. These files can be stored and viewed later. RemotePC saves the recorded file in AVI/MPEG format and it can be played via Windows Media Player or VLC. From the application menu, go to 'Utilities' -> 'Recording'. Provide a name for the file, enter tags, choose a path, and click 'Save'. Provide a name for the file, choose a path, and click 'Save'. Provide name for the file, select the particular path and click 'Save'. 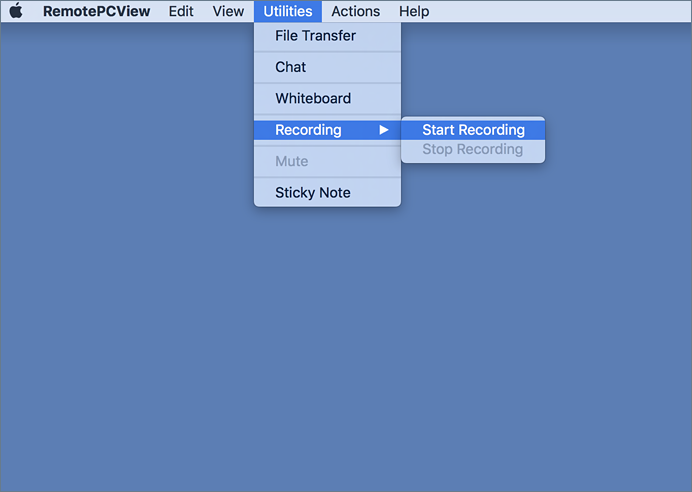 Yes, you can make notes on your remote computer screen with the help of the 'Sticky Note' feature. Note: You can save and view the same after the remote session ends, in an offline mode. To save a note on your local computer, click on the Sticky Note window, choose the destination folder, and click Save. With Whiteboard, you can draw on the remote screen during a session to collaborate effectively. Click 'Whiteboard'. The Whiteboard panel will pop up on the screen. Pen: Select to draw on the remote screen. Choose a line width or color of your preference. Eraser: Select to clear parts of the drawing on the screen. Choose a suitable width for the eraser. Yes, you can play music and watch video on the remote computer from your local computer. 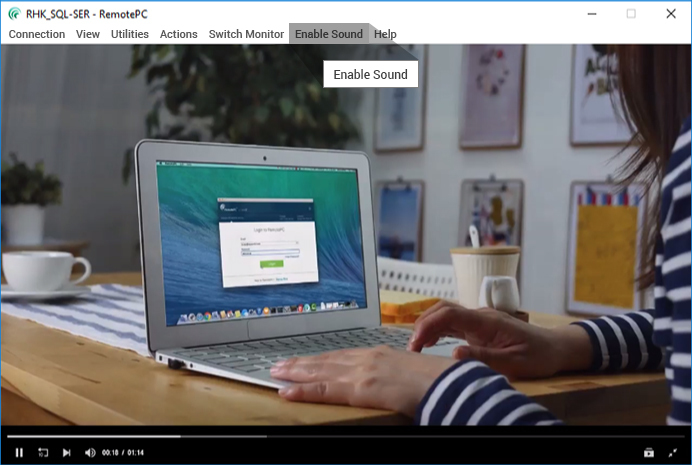 Click 'Enable Sound' to play music or video. To mute audio, click 'Disable Sound'. Click on to play and to mute audio. In Mac OS High Sierra and above, to play audio remotely you need to allow permission for RemotePC to install sound driver on your computer. Click 'OK' when prompted to open System Preferences. You will be redirected to 'Security and Privacy' preferences. Click 'Allow' under the 'General' pane to download the remote sound driver on your computer. 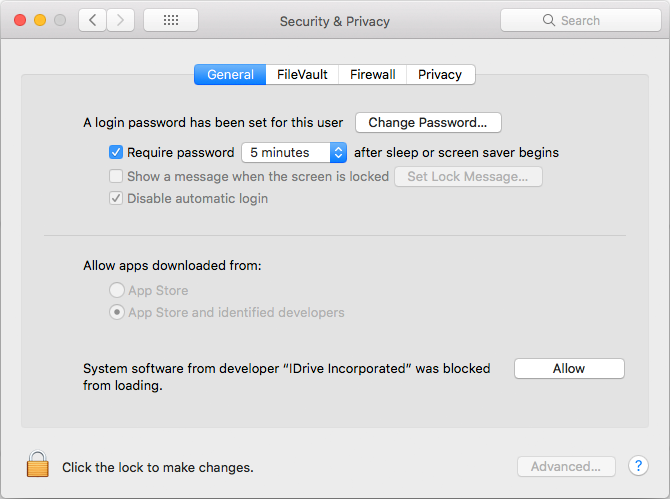 To enable later, navigate to 'Security and Privacy' in the Apple menu and click 'Allow' under the 'General' pane. Note: This feature is currently not available while accessing a PC from Mac or vice versa. Yes, you can use keyboard shortcuts (such as Ctrl + C) on your remote computer during a remote session, by enabling the 'Send Key Combinations' / 'Send Key Combination' feature in Windows and Mac respectively. From the application menu, go to 'Actions'. Click 'Send Key Combinations' / 'Send Key Combination'. Yes, you can lock the partner computer screen during a remote session. Click 'Lock' -> 'Lock now', to instantly lock the partner computer screen. 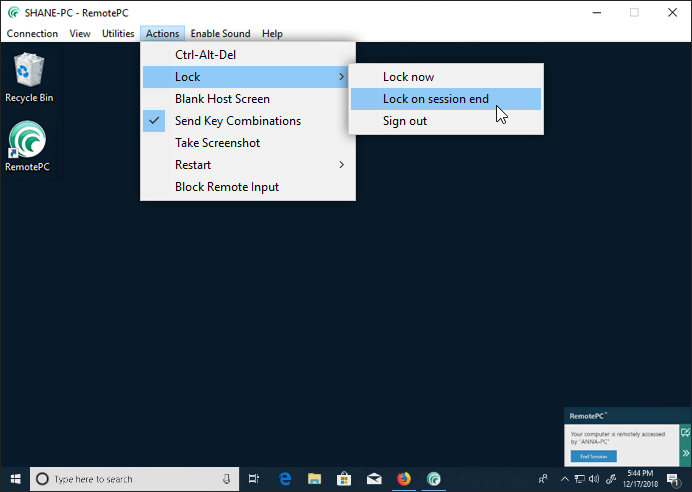 Click Lock -> 'Lock on session end', to lock the partner computer screen as soon as the remote session ends. Click 'Lock' -> 'Sign out'/ 'Logout' to log off the current user profile. You can also lock the remote computer using the Ctrl+Alt+Del command. When connected to a remote Windows system, the Ctrl+Alt+Del keyboard command will open the screen with Lock, Task Manager, Sign out, and related options. When connected to a remote Mac machine, the Ctrl+Alt+Del keyboard command will open the 'Force Quit Applications' window. In order to avoid others from viewing your remote computer screen during an ongoing session, you can black out the screen of your remote computer. The 'Blank Host Screen' feature is helpful in such scenarios where you do not have physical access to the machine to turn off the display of the remote computer. Note: This functionality is not supported for Microsoft Windows 10 operating system. Yes, you can prevent users at the remote end from using mouse and keyboard during a session with the 'Block Remote Input' option. Yes, with RemotePC you can print documents and images that are on your remote computers from wherever you are. Select the file on the remote computer that is to be printed. Open the document and use Print command (or Ctrl+P) to print the selected document. Select 'RemotePC Printer' in the window and click 'Print'. Select a local printer when prompted, and click 'Continue'. If a local printer is not configured, click 'Open Document' to view or save the document on the local computer. If more than one local printer is configured, the printing operation will be performed using the default printer. 'RemotePC Printer' will be displayed only during active remote sessions. Yes, you can use the RemotePC application via VPN. It allows you to create a secure connection between the local and remote computer and the connected computers act as if they are in the same network. Thus, users experience no lag during a remote session, and can work as if on their own computer. With the above requirements, RemotePC automatically detects the VPN and establishes a connection between the local and remote computer. Yes, you can end an ongoing session when your computer is being remotely accessed. When a remote computer connects to your computer, a message appears on the bottom-right corner of the screen. You can end the session and restrict access to the remote computer by clicking 'End Session'. Right click on the computer name and click 'Rename'. Type a new name in the text field and click 'Rename'. Right click on the computer name and click 'Remove'. You can only remove the computers that are online or offline. Yes, you can drag and drop files/folders between your local and remote computer during an ongoing session. Also, you can copy multiple files from the remote computer to your local computer, or vice versa. You can securely transfer files across multiple platforms i.e., from Windows to Mac or vice versa. 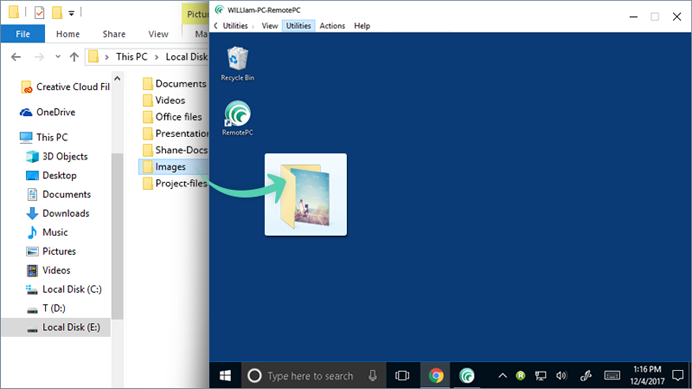 For Windows, you can also copy and paste files/folders for transferring them between remote computer and your local computer. 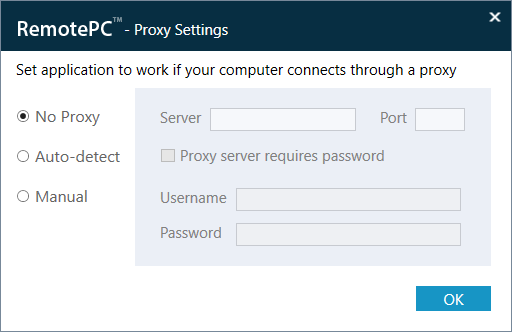 To configure proxy settings, right-click the RemotePC tray icon and select 'Proxy Settings'. No Proxy: This is a default setting. Auto-detect: Select to get the proxy settings automatically. Manual: Select and configure the proxy server name, port and authentication details. Learn more about hardware requirements and settings configuration needed to successfully enable WOL in Windows computers for WOL. Note: This functionality is currently not supported for Mac. Click 'Configure Now!' and configure your computer for remote access. Click displayed on the top-right corner. 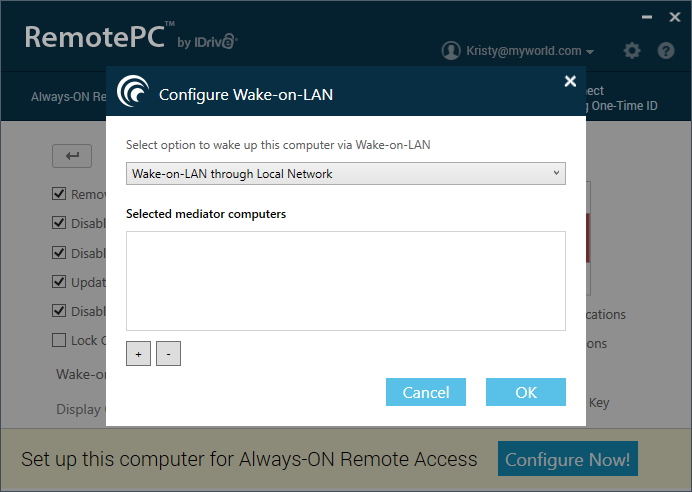 Select 'Wake-on-LAN through Local Network' from the 'Select option to wake up this computer via Wake-on-LAN' drop-down list. Click , select the computers you want to add as mediator computers and click 'Add'. Note: Ensure that the selected mediator computer is in the same network (LAN) as the local computer. Select 'Wake-on-LAN through Public IP' from the 'Select option to wake up this computer via Wake-on-LAN' drop-down list. Enter a Public IP and port number in 'Address' and 'Port' fields respectively. Click displayed next to the offline computer name to wake up that computer.